Incidents of murder and other grave offences committed against persons marrying or proposing to marry sagotras or outside their castes/religions are periodically reported. It is learnt that number of cases goes unreported for fear of reprisals or cascading effects. The intervention of caste/community assemblies in the name of ‘Khap Panchayats’, ‘Katta Panchayats’ etc. in the occurrence of these offences and other related incidents involving serious life and liberty consequences, are frequently noticed. Such assemblies gathered on caste lines assume to themselves the power and authority to declare on and deal with ‘objectionable’ matrimonies and exhibit least regard for life and liberty and are not deterred by the processes of administration of justice. The penal law lacks direct application to the illegal acts of such caste assemblies and needs to be amended. Meanwhile innocent youth are harassed and victimized while such assemblies continue to wield unhindered authority and also seem to resist any suggestion of being subjected to any social control. The pernicious practice of Khap Panchayats and the like taking law into their own hands and pronouncing on the invalidity and impropriety of Sagotra and inter-caste marriages and handing over punishment to the couple and pressurizing the family members to execute their verdict by any means amounts to flagrant violation of rule of law and invasion of personal liberty of the persons affected. Sagotra marriages are not prohibited by law, whatever may be the view in olden times. The Hindu Marriage Disabilities Removal Act,1946 was enacted with a view to dispel any doubts in this regard. The Act expressly declared the validity of marriages between the Hindus belonging to the same ‘gotra’ or ‘pravara’ or different sub-divisions of same caste. The Hindu Marriage Act does not prohibit sagotra or inter-caste marriages. The views of village elders or family elders cannot be forced on the willing couple and no one has a right to use force or impose far-reaching sanctions in the name of vindicating community honour or family honour. There are reports that drastic action including wrongful confinement, persistent harassment, mental torture, infliction of severe bodily harm is resorted to either by close relations or some third parties against the so-called erring couple either on the exhortations of some or all the Panchayatdars or with their connivance. Social boycotts and other illegal sanctions affecting the young couple, the families and even a section of local inhabitants are quite often resorted to. The cumulative effect of all such acts have also public order dimensions. In a very recent case – Arumugam Servai vs. State of Tamil Nadu [reported in (2011) 6 SCC 405], the Supreme Court strongly deprecated the practice of khap/katta panchayats taking law into their own hands and indulging in offensive activities which endanger the personal lives of the persons marrying according to their choice. Some proposals are being mooted proposing amendments to Section 300 I.P.C. by way of including what is called ‘Honour Killing’ as murder and shifting the burden of proof to the accused. These proposals have been studied. The views from various quarters at an informal level have also been ascertained. After a preliminary examination of these and certain other models of law, a broad framework of proposed law to deal with the situation has been prepared and annexed herewith. The views of the public are invited with reference thereto. The idea underlying the aforesaid provisions is that there must be a threshold bar against congregation or assembly for the purpose of discussing on and objecting to the conduct of young persons of marriageable age marrying according to their choice, the ground of objection being that they belong to the same gotra or to different castes or communities. The Panchayatdars or caste elders have no right to interfere with the life and liberty of such young couples whose marriages are permitted by law and they cannot create a situation whereby such couples are placed in a hostile environment in the village/locality concerned and exposed to the risk of safety. Such highhanded acts have a tendency to create social tensions and disharmony too. No frame of mind or belief based on social hierarchy can claim immunity from social control and regulation, in so far as such beliefs manifest themselves as agents of enforcement of right and wrong. The very assembly for an unlawful purpose viz. disapproving the marriage which is otherwise within the bounds of law and taking consequential action should be treated as an offence as it has the potential to endanger the lives and liberties of individuals concerned. The proposed law is not in derogation of the provisions of Indian Penal Code which can take care of various offences of serious nature perpetrated by the members of caste panchayats in prosecution of their unlawful objective. The Commission is prima facie of the view that there is no need for introducing a provision in Section 300 IPC in order to bring the so-called ‘honour killings’ within the ambit of this provision. The existing provisions in IPC are adequate enough to take care of the situations leading to overt acts of killing or causing bodily harm to the targeted person who allegedly undermined the honour of the caste or community.The motive behind killing a person does not furnish real justification to introduce a separate provision in section 300, as is contemplated to be done under the proposed Bill (as published in the newspapers). Probably, the addition of such clause may create confusion and interpretational difficulties. Further, shifting the onus on to the accused facing accusations of involvement in the serious offence of murder etc or abetment thereof is not desirable. Such a move will be against the cardinal principles of jurisprudence accepted and absorbed into our criminal justice system. If burden of proof has to be shifted in such a case, logically, it will have to be done in a large number of other heinous crimes. A holistic approach is called for and any attempt to drastically expand the rigour of criminal procedure to cope up with ad hoc situations may be counter-productive. The introduction of such a drastic provision needs to be avoided. As an alternative to this, the Commission is of the prima facie view that a presumption could be raised in respect of commission of the prohibited acts in clauses 3 and 4 of the proposed Bill, if he or she is a member of an unlawful assembly convened for the purpose of discussing and condemning the perfectly legal conduct of a young couple – married or intending to marry. This is necessary having regard to the fact that the task of identification of roles that may be played by one or more members of assembly, is difficult to accomplish as the eyewitnesses may not be willing to depose and the circumstantial evidence will not be strong enough to implicate the guilty. In such a situation, the presumption as envisaged by clause 6 will assume a significant role. 1. (1) This Act may be called the Prohibition of Unlawful Assembly (Interference with the Freedom of Matrimonial Alliances) Act, 2011. (3) It shall come into force in a State on such date as the Central Government may, by notification in the Official Gazette, appoint and different dates may be appointed for different States. 2. (1) No person or any group of persons shall gather, assemble or congregate at any time with the view or intention to deliberate on, or condemn any marriage, not prohibited by law, on the basis that such marriage has dishonoured the caste or community tradition or brought disrepute to all or any of the persons forming part of the assembly or the family or the people of the locality concerned. Explanation: ‘Marriage’ shall include a proposed or intended marriage. (2) Such gathering or assembly or congregation shall be treated as an unlawful assembly and every person convening or organizing such assembly and every member thereof participating therein shall be punishable with imprisonment for a term of not less than six months but which may be extend to one year and shall also be liable to fine up to ten thousand rupees. 3. Any member of an unlawful assembly who alone or in association with other such members counsels, exhorts or brings pressure upon any person or persons so as to prevent, or disapprove of the marriage which is objected to by the said members of the unlawful assembly, or creates an environment of hostility towards such couple or either of them or their relatives or supporters, shall be deemed to have acted in endangerment of their liberty and such an act of endangerment shall be punishable with imprisonment for a term of not less than one year but which may extend to two years and shall also be liable to fine up to twenty thousand rupees. 4. (1) Any member of an unlawful assembly who, with a view to secure compliance with the illegal decision of that assembly in relation to the marriage that is being objected to, indulges in criminal intimidation of the couple or either of them or their relatives or supporters shall be punishable with imprisonment for a term of not less than one year but which may extend to three years and shall also be liable to fine up to thirty thousand rupees provided that if the threat be to cause harm or injury of the description referred to in second part of Section 506 IPC, the maximum punishment shall extend to seven years of imprisonment instead of three years and fine extending to thirty thousand rupees. Explanation: The expression ‘criminal intimidation’ shall have the same meaning as is given in section 503 of the Indian Penal Code. 5. The provisions in Sections 2, 3 and 4 shall be in addition to and not in derogation of the provisions in the Indian Penal Code. 6. In a prosecution under section 3 or section 4, if it is found that any accused person participated or continued to participate in an unlawful assembly, the Court shall presume that he intended and decided to take all necessary steps to put into effect the decision of unlawful assembly including the commission of acts referred to in Sections 3 and 4. Amendment of Act 43 of 1951. Power to prohibit certain acts. 8. (1) Where the Collector or District Magistrate receives information that there is a likelihood of convening of an unlawful assembly, he shall, by order, prohibit the convening of any such assembly and doing of any act towards the commission of any offence under this Act by any person in any area specified in the order. (2) The Collector or District Magistrate may take such steps as may be necessary to give effect to such order, including giving of appropriate directives to the police authorities. (3) The Collector or District Magistrate shall also take such steps as may be necessary to ensure the safety of the persons targeted pursuant to the illegal decision taken by the unlawful assembly. Trial of offences under this Act. 9. (1) Notwithstanding anything contained in the Code of Criminal Procedure, all offences under this Act shall be triable by a Special Court constituted under a notification issued in the official gazette and the special court shall be presided over by an officer of the rank of Sessions Judge or Addl. Sessions Judge. (2) The State Government shall in consultation with the High Court constitute one or more Special Courts for the trial of offences under this Act and every Special Court shall exercise jurisdiction in respect of the whole or such part of the State as may be specified in the notification. Procedure and power of Special Court. 10. (1) A Special Court may take cognizance of any offence, without the accused being committed to it for trial, upon receiving a complaint of facts which constitute such offence, or upon a police report of such facts. (2) Subject to the other provisions of this Act, a Special Court shall, for the purpose of the trial of any offence, have all the powers of a Court of Session and shall try such offence as if it were a Court of Session, so far as may be, in accordance with the procedure prescribed in the Code of Criminal Procedure for trial before a Court of Session. 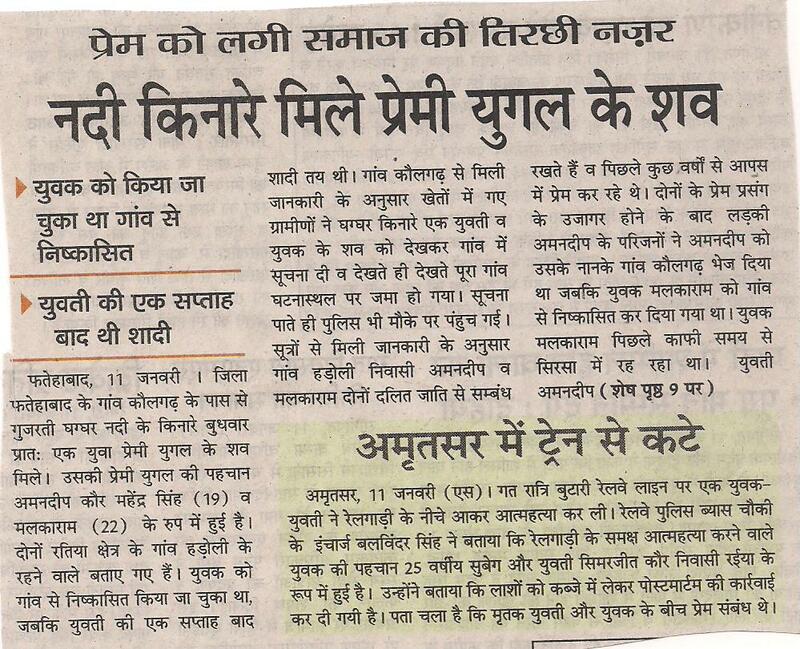 Power of Special Court with respect to other offences. 11. (1) When trying any offence under this Act, a Special Court may also try any other offence with which the accused may, under the Code, be charged at the same trial if the offence is connected with such other offence. (2) If, in the course of any trial of any offence under this Act,it is found that the accused person has committed any other offence under this Act or any other law, the Special Court may convict such person also of such other offence and pass any sentence authorized by this Act or such other law for the punishment thereof. Offences to be cognizable, non-bailable and non- compoundable. 12. Notwithstanding anything contained in the Code of Criminal Procedure, all offences under this Act shall be cognizable, non- bailable and non-compoundable. There has been a spurt in illegal intimidation by self-appointed bodies for bringing pressure against Sagotra marriages and inter-caste, inter-community and inter-religious marriages between two consenting adults in the name of vindicating the honour of family, caste or community. In a number of cases, such bodies have resorted to incitement of violence and such newly married or couples desirous of getting married have been subjected to intimidation and violence which has also resulted into their being hounded out of their homes and sometimes even murdered. Although such intimidation or acts of violence constitute offences under the Indian Penal Code, yet, it is necessary to prevent assemblies which take place to condemn such alliances. This Bill is therefore, proposed to nip the evil in the bud and to prevent spreading of hatred or incitement to violence through such gatherings. The Bill is designed to constitute special offences against such assemblies, in addition to other offences under the Indian Penal Code. Two incidents of honour killing, a practice primarily associated with northern states, have been reported in Karnataka during the past 10 months. 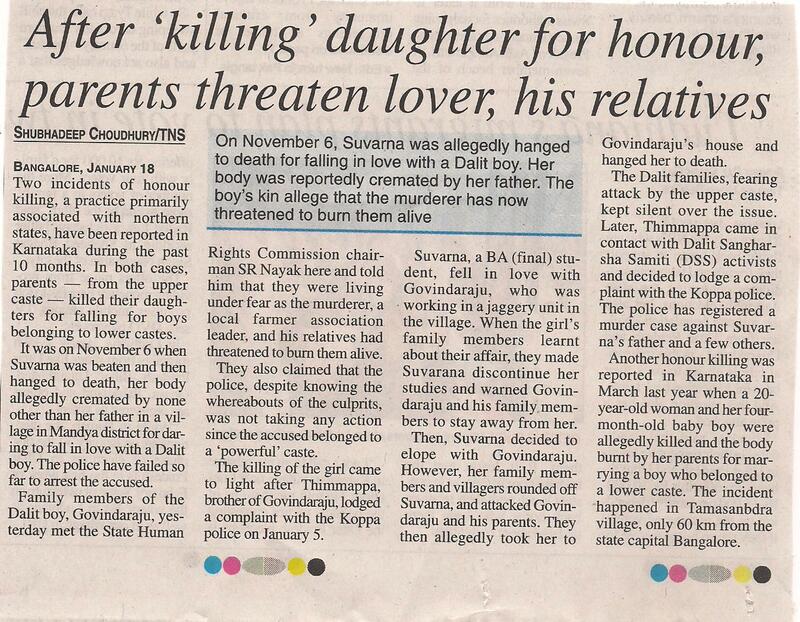 In both cases, parents — from the upper caste — killed their daughters for falling for boys belonging to lower castes. It was on November 6 when Suvarna was beaten and then hanged to death, her body allegedly cremated by none other than her father in a village in Mandya district for daring to fall in love with a Dalit boy. The police have failed so far to arrest the accused. Family members of the Dalit boy, Govindaraju, yesterday met the State Human Rights Commission chairman SR Nayak here and told him that they were living under fear as the murderer, a local farmer association leader, and his relatives had threatened to burn them alive. They also claimed that the police, despite knowing the whereabouts of the culprits, was not taking any action since the accused belonged to a ‘powerful’ caste. The killing of the girl came to light after Thimmappa, brother of Govindaraju, lodged a complaint with the Koppa police on January 5. Suvarna, a BA (final) student, fell in love with Govindaraju, who was working in a jaggery unit in the village. When the girl’s family members learnt about their affair, they made Suvarana discontinue her studies and warned Govindaraju and his family members to stay away from her. Then, Suvarna decided to elope with Govindaraju. However, her family members and villagers rounded off Suvarna, and attacked Govindaraju and his parents. They then allegedly took her to Govindaraju’s house and hanged her to death. The Dalit families, fearing attack by the upper caste, kept silent over the issue. Later, Thimmappa came in contact with Dalit Sangharsha Samiti (DSS) activists and decided to lodge a complaint with the Koppa police. The police has registered a murder case against Suvarna’s father and a few others. Another honour killing was reported in Karnataka in March last year when a 20-year-old woman and her four-month-old baby boy were allegedly killed and the body burnt by her parents for marrying a boy who belonged to a lower caste. The incident happened in Tamasanbdra village, only 60 km from the state capital Bangalore. Noida: A 16-year-old girl was allegedly murdered by her three brothers after they came to know about her relationship with a boy in the neighbourhood here, police said on Monday. According to Superintendent of Police (City) Anant Dev, the girl, a resident of Nangli village, was murdered by her brothers Subhash, Vikas and Lalit. All three have been arrested. “The girl was in a relationship with a boy for the past several months and her brothers objected to it,” he said. “The three brothers said they were also distressed on hearing bad comments from people about her. They tried to make her understand on many different occasions but she did not pay heed to their warnings,” he said. “On the intervening night of Dec 28 and 29, the three accused took their sister in a car to Chapraula village. There, they tried to insist her to end her relationship with the boy and mend her ways but she did not budge,” Dev said. Enraged on her refusal to heed their warnings, the brothers took out a metal tool and hit her on the head after which she collapsed. They then throttled her and dumped her body near the Hindon river barrage. The body is yet to be recovered. The accused said they did not know the whereabouts of the boy, who is also missing. A case of murder has been registered against the three brothers at Sector-49 police station. Date: 09/01/2012 This Petition was called on for hearing today. For Petitioner(s) Mr. Ravi Kant, Adv. Mr. Prakash Kumar Singh, Adv. Mr. A. Mariarputham, Sr. Adv. Mr. Devanshu K. Devesh, Adv. Mr. Khawairakpam Nobin Singh, Adv. Mr. Anil K. Pandey, Adv. Mr. Raju Ramachandran, learned senior advocate with Mr. Gaurav Agrawal, learned advocate is requested to assist the court as amicus curiae in the matter. Both of them accept the responsibility. Let copies of the writ petition (complete with annexures) and the responses filed by the different States be given to Mr. Gaurav Agrawal. Mr. Ramachandran shall prepare a summary of the States’ responses indicating the steps taken by the different State Governments to deal with the menace of extra-constitutional bodies dispensing “justice”, violating and interfering with the Constitutional and legal rights of the individuals. Mr. Ramachandran will also suggest measures to effectively confine and limit the activities of such bodies and social groups within lawful parameters. Put up on March 12, 2012.